When Xbox 360 conked out in the past, folks would send their Xbox 360s to Microsoft in cardboard boxes affectionately called "coffins". 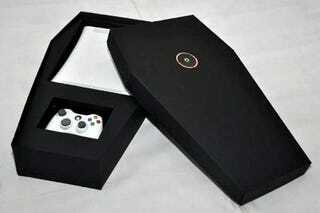 Here is a real honest-to-goodness Xbox coffin. Designed by designer Alexis Vanamois, this Xbox 360 Red Ring of Death coffin is a final resting place for a dearly departed console. There's even a holder for a controller.